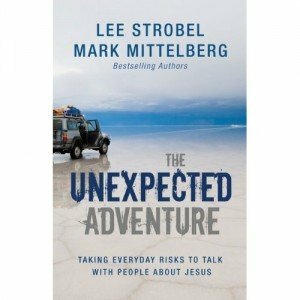 Just this past week, I picked up a copy of The Unexpected Adventure: Taking Everyday Risks to Talk with People about Jesus. One of our mission supporters enabled us to acquire a Nook, the e-reading device from Barnes and Noble, and this was one of the first books I acquired. I simply needed something to read on the airplane and chose this one. Since I read widely in this field in personal evangelism, I wasn’t expecting anything new or great, just another book on how to share your faith. I was wrong. It wasn’t the bland familiar read I was expecting. The only word I can find to describe this book is Riveting! For example, this morning, I simply wanted to read the next chapter of The Unexpected Adventure: Taking Everyday Risks to Talk with People about Jesus in my devotional time. Several chapters and 90 minutes later, I found myself yearning for more those type of evangelism encounters to happen in my life. This book is a collection of 42 real life stories from the authors about their experiences in personal evangelism. Conversations, turning points, failures, struggles, successes — all laid out in a brief daily reading type format. Several of these stories had me laughing with them at their mistakes, errors, and fumblings. But at the same time, these stories show how God’s sovereignty still brings people to faith through personal evangelism efforts. Each daily reading has a story, an encouragement to try something different that day, an action principle, and a closing scripture verse. But as I found out, it was hard to put this book down after one daily reading. Personal Evangelism can be normal. In many first hand stories, Strobel and Mittelberg relate how evangelism can be a normal everyday occurrence in a person’s life. their annoyances at having their days interrupted with strangers initiating conversation. One key theme running through the book is learning to see those God given moments as divine appointments, where you might have the opportunity to help someone make another step forward in their spiritual journey. One consistent theme in the book is that evangelism is a process or journey. Your conversation may be just one link in the chain, one step in that process. It’s a prime example of the links in the chain principle of helping people find faith. The more I listen to stories of conversions and faith awakenings, the more I am convinced that people need to see the process of evangelism from the beginning of the seeking journey. You might be afraid of sharing your faith. You might be thinking that you need to be some skilled evangelist. In 42 personal stories, Strobel and Mittelberg show you a way to view evangelism differently. Instead of making sure we have mastered every cranny of gospel information and philosophical argument, our focus is to be alert for the prompting of the Holy Spirit to engage people the He underlines for us. If we are able to do this, we will find appropriate ways to engage people in a natural conversation about Jesus and his transforming power.